The Sobotka Seed Stage Success Stories will introduce you to former recipients of the grants who share their experience and perspective. The Yale Center for Business and the Environment is proud of its alumni and aspires to build a robust entrepreneurial community around sustainability ideas. Patrick Reed (YC ‘16) and Gabe Rissman (YC ‘17) initially joined forces through activism. As undergraduates, they were co-leaders of the student group Fossil Free Yale, which pressures Yale to withdraw its investments from the fossil fuel industry. Yale is a large and influential investor, with a $29 billion endowment. If it changes its investment practices, it spurs a tangible and immediate impact, which isn’t the case for most individual investors. But individual investments add up. Rissman and Reed realized that with the right tools and information, individuals could work together to make even more change than large investors like Yale. The pair set out to empower individual investors. In 2017, they founded Real Impact Tracker, which was awarded a Sobotka Seed Stage Venture Grant in December of that year. Since then, they’ve used the $10,000 grant funding to help start a platform called Stake, where shareholders can band together to support social and environmental causes. “We created Real Impact Tracker and Stake to help individual investors unlock their potential to create impact with their investments,” said Rissman. Reed and Rissman focused on academic research before diving into entrepreneurship. While at Yale, they co-wrote three papers on sustainable investing. They wanted their findings to be relevant and actionable outside of the academic world, so they decided to publicly rate mutual funds, based on sustainability. In doing so, they sought guidance from Cary Krosinsky (Yale faculty), a pioneer in the field of sustainable investing. Krosinsky’s network and experience enabled him to advise their rating methods and to connect them with key players in the field. 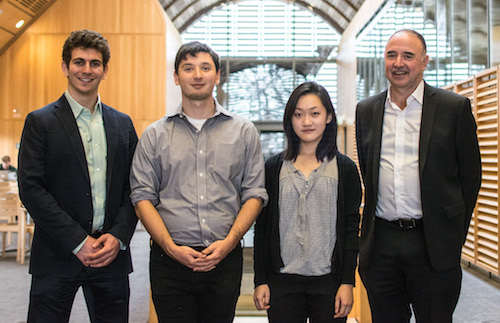 Reed and Rissman rounded out the team by bringing on Pei Hua Chen (YC ‘21) to develop messaging and communications. The original duo dedicated themselves full-time to the venture after graduation. Over the following months, they developed a system for rating mutual funds and certifying fund managers. They compare “Real Impact” funds and managers to LEED buildings or USDA Organic produce. When options are verified by a third party, consumers can make informed and responsible choices. Reed and Rissman know that consumers might be hesitant to trust a black box verification scheme, so they’re making the standards entirely transparent and open-sourced, similar to what B Lab has done for its process of certifying responsible companies as B Corps. Using the Stake platform, individual investors can go a step further to engage with the funds and companies where they’ve invested their money. With just a few clicks, they can put their shares behind causes or “Asks” that have been put forward by advocacy organizations or other users. The model is like Change.org but backed with dollars rather than signatures. Real Impact Tracker enlists the help of “Champions”—large investment managers with a proven track record for making change—to advocate on behalf of the most popular Asks. Right now, the platform is free to use for individual investors. The company makes money through fund managers and financial advisers. The fund managers pay for Real Impact certification, enabling them to demonstrate their commitment to impact, and the financial advisors pay for subscriptions to Stake, enabling them to learn more about their clients’ interests. The $10,000 Sobotka Grant helped Real Impact Tracker to move forward in several key areas. First, it enabled the company to incorporate as a Benefit Corporation. Second, it helped the company to expand its communications and operations. Lastly, and most importantly, it helped to build the Stake platform, which is now online. This ended up being a larger challenge than anticipated. Reed and Rissman have continued to work full-time on Real Impact Tracker. They’re now in a transition phase, as they figure out how to move to a larger financial market, either New York or San Francisco. Their main advice to future student entrepreneurs is to prioritize customer needs and adapt products accordingly. “Constantly talking to customers while developing our product helped us make it something that people would love to use,” said Reed.